When Deus Ex: Human Revolution was announced it was difficult to get too excited about its prospects. Like the upcoming Max Payne 3, it was to be a game developed by a studio far removed from those who created the original games – in this case, no Warren Spector, no Harvey Smith. Not only that, but a brand-new untested studio working with their own proprietary engine. Needless to say, I held a fair amount of trepidation. Then things began to get interesting, previews were doing the rounds, different outlets were praising the presentation of adaptable and variable gameplay, the police station sequence was trotted out to show just how divergent the gameplay and player’s approach could be. By the time I loaded up Deus Ex: Human Revolution my trepidation had turned to intrigue had turned to excitement. The first two Deus Ex games were powerful and unique statements of intent, ambitious but limited – the sequel in particular receiving its fair share of criticism as dissected in our recent retrospective. Unfortunately, their promising and unique template was sparingly used over the years. And so, the idea that a game could successfully carry the baton of multiple-gamestyles, conspiracy-laden narrative and branching-progression 8 years after Invisible War’s release is an enthralling one. And perhaps, that is Human Revolution’s singular most noteworthy achievement. It feels like Deus Ex. It is different, it’s different in a whole myriad of ways, but the developer has succeeded in capturing something, some ineffable essence of the original, that hits you between the eyes until you’re not seeing stars but instead floating JC Dentons, protagonist of the original game. It begins with a conspiracy-laden cutscene (what else?) before shifting you into the role of yet-to-be-augmented Adam Jensen. In our recent Looking Back… feature, we discussed how the first Deus Ex sequel, Invisible War, began very differently to its predecessor. Instead of throwing you into the action, the start of the game focused on incorporating you into the narrative – beginning the game with an ‘event’. Human Revolution takes this one step further, the start to the game is all narrative as you proceed on an on-the-rails tour of the facility that your character works at just as a terrorist attack occurs. Cleverly the game gives you a taste of pre-augmented Adam as you shoot your way through the intruders in an attempt to secure the safety of ex-girlfriend and very-important scientist Megan. Without giving too much away, this setpiece doesn’t end well for either Adam or Megan. You resume the role of Adam six months later as he returns to work, having been severely augmented following the attack. This is where the game really begins as you are provided with a range of objectives, some of them related to your main quest, some side-quests. Even with side-quests there are links and crossovers to your main objectives meaning fulfilling them bags you more than just a “Completist” XP bonus, it gets you a richer wider view of the game-world. And what a world – atmospheric, moody, alive. The game engine uses shadows, depth of field and SSOA to great effect. Despite the game being predominantly an unfortunate shade of orange, on the consoles or a decent PC system the use of lighting elevates the visuals to a stylized and noir-influenced level. Stylistically the game is quite removed from the previous two Deus Ex games, to be expected really, and if anything a lot of the game characters seem to be manga/jRPG influenced - the protagonist himself is all spiked hair, pointy beard and black trenchcoat – but it does work. You buy into the game-world in a way that not many games achieve. The story and the game-world is complex and engaging, if not somewhat overly indebted to traditional archtypes. From the cocksure female pilot to the snarky IT tech to the brooding troubled hero with a history, we’ve seen all this before. Nonetheless it is different enough and executed so well that the sometimes familiarity you experience doesn’t hinder your experience. Similarly some characters are distinct and noteworthy, questioning and persistence sometimes revealing interesting tidbits of backstory and tragedy in the most innocuous bystander. This versatility existed in the original games - the ability to hack computers and switch turrets and cameras on and off, for example, remains – but it is complemented by the incorporation of newer gaming tropes such as iron sight and a cover mechanic, a first for the series, that works surprisingly well. This malleability to individual approaches extends to your character. 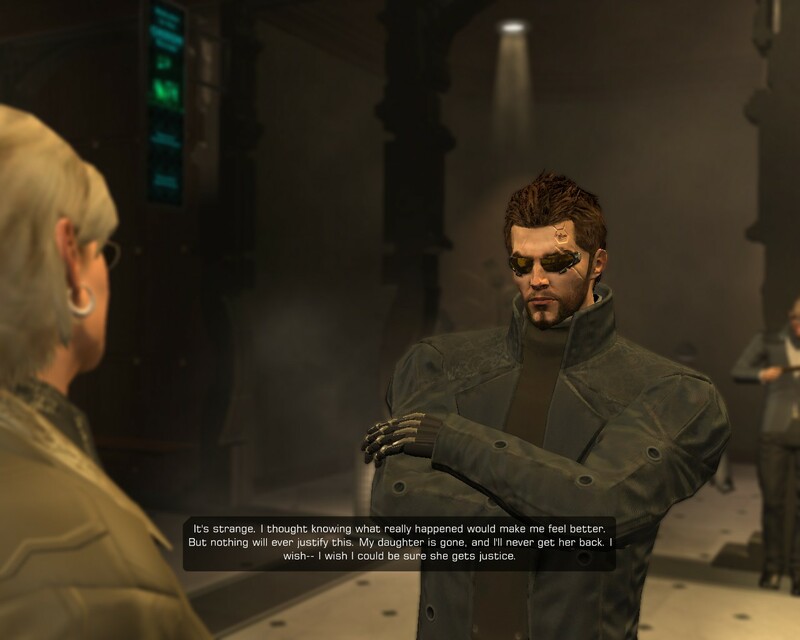 Like the previous Deus Ex games you are able to ‘augment’ your character with different abilities – augmentation itself playing a key role in the game’s plot. There are a huge variety of abilities that you can acquire either by paying for a ‘praxis’ kit or building up enough XP to unlock a praxis point. Such was my desire to gain new abilities and explore the range of abilities available to me I was extra-motivated to complete secondary objectives just to bump up my XP. From increased hacking abilities (this itself varies from greater stealth in your hacking to the ability to hack more sophisticated systems) to increased jumping and speed to the implementation of an explosive system in your body, the augmentations are diverse and all have an application in the game. There aren’t many criticisms that you can throw at the game that you can consider fair. I mean, it’s easy to pick holes in a game that attempts to offer realism but allows you to steal credits off people’s desks pretty much in front of them without notice, or allows you to boldly walk out of a detective’s office you just snuck into without any of the police around asking – “hold on, what were you doing in there?”. That said a clear area that has caused a stir on the internet is the use of boss encounters. The boss fights are unavoidable and no matter what your previous pacifist leanings in your approach to the game - you have to fight the bosses. They're challenging too, particularly if you've, for example, used a lot of praxis points on stealth and hacking only to find yourself slightly under-equipped in a one-to-one battle. That's not to say there aren't different approaches to the fight - I tended to hide and just lob grenades, and this does go some way to making up for forced nature of the battle, but not quite. Another area that may be singled out is the at times questionable depiction of race. The character of Letitia has caused quite the stir, but in my eyes the most questionable depiction is that of a Chinese brothel that plays into a range of Western stereotypes and clichés best summed up by the film quote "me love you long time". These are ultimately minor gripes though and even in these missteps you can see the good intentions of the developer coming through. The boss encounters do add a sense of drama and heightened tension, just as the variety of people you encounter and locations you visit work to contribute to the overall sense that this is a genuine world you are exploring. Deus Ex: Human Revolution carries the baton for the series with ease. It is everything that gamers loved of the first game - engrossing, thrilling, compulsive. The secondary objectives and sheer size of the game world evoke that "gotta catch 'em all" mentality so common in RPGs and the gameplay offers a variety and thoughtful dearly lacking in so many of today's triple-A titles. Whereas some modern blockbuster games can feel like a rollercoaster - fun but much like your simply following the path laid out before you - Human Revolution offers so much more. The game is a professional and polished package, the introductory credits sequence befitting of a film or high-quality television show and the story more than just a conspiracy thriller - it poses questions about what it means to be human, at what cost can our civilisation continue to progress. Human Revolution is a revelation and it is a hugely impressive feat that a new studio has managed to not only create such a fantastic and enjoyable game, but one that so effortlessly captures the tone and feel of its predecessors. Indeed Human Revolution succeeds so fully because it is more than just the third sequel in the Deus Ex series - it is an utterly fantastic game in its own right. With that in mind, how could I deny the game a perfect 10? To my eyes for a game to score a 10 it's not that it should be perfect - I've never played a perfect game (oh, okay, maybe Ocarina of Time when I was 11) - instead it should be that the game is original, ambitious, enjoyable, innovative. 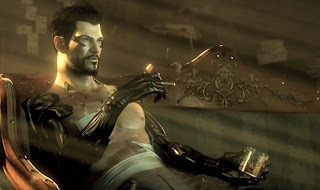 Deus Ex: Human Revolution is all this and more, so how could I deny it that 10? Deus Ex is available on PC, Xbox 360 and PS3.